Khao soi and so much more. 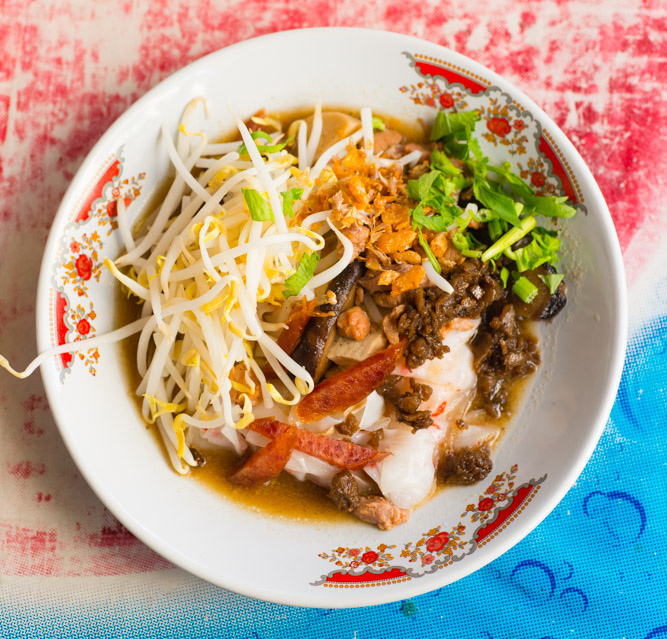 You may have crossed paths with boat noodles. Perhaps you’ve even dabbled in khao soi. 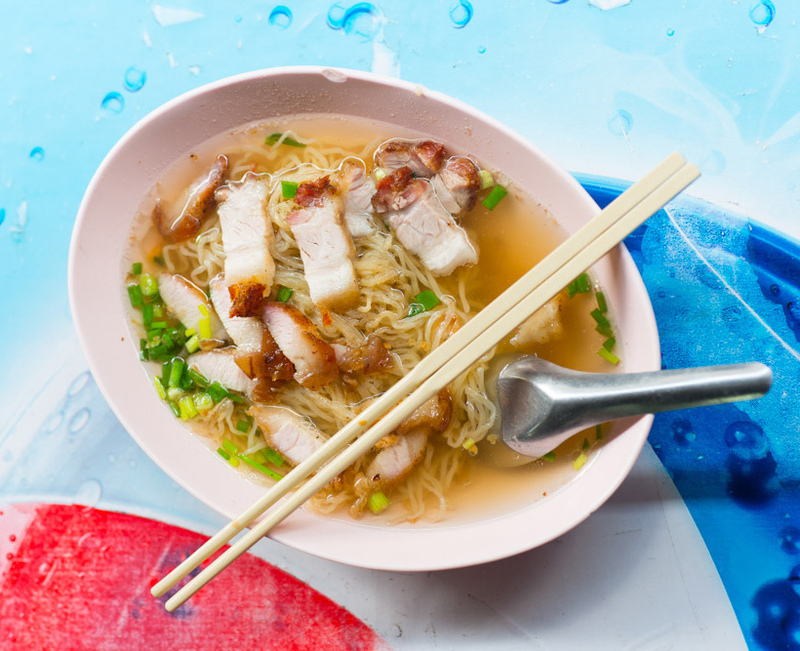 But if you’ve been eating Thai noodles in the U.S., you’ve undoubtedly only scratched the surface of Thailand’s vast world of noodle soups. Much is written about Thailand’s obsession with rice, but when given the choice, most Thais would probably opt for a bowl of noodles. And why not? 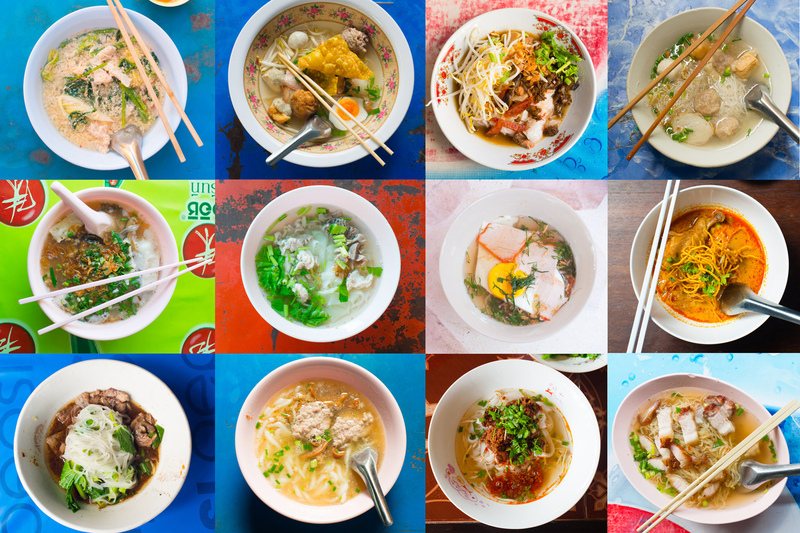 Reflecting the diversity of Thai food as whole, the blanket term “Thai noodle soups” spans a huge variety of dishes, ranging from those with apparent roots in Southeast Asia to direct imports from China—as well as several bowls that straddle both of these influences. Simply put, there’s a noodle for everybody. Yet adding to the complexity of the landscape is the fact that Thai noodle dishes are highly customizable. 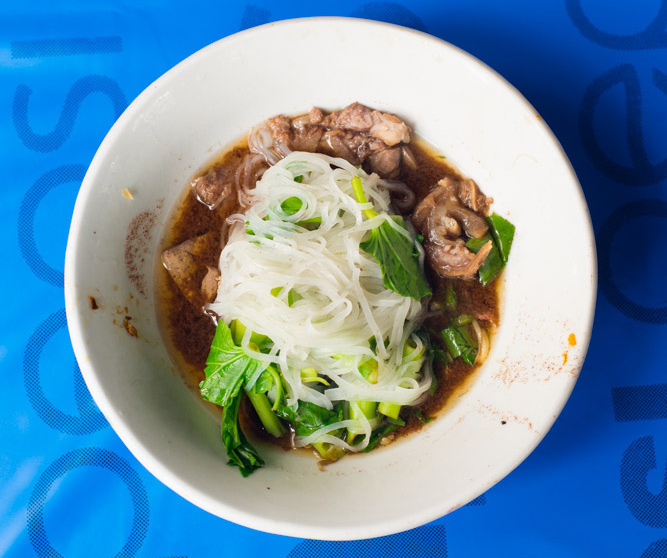 Do you want your boat noodles served with beef or pork? Do you prefer sen lek (rice) or bamii (wheat-and-egg) noodles? Served with broth or haeng(dry)? And do you want your noodles served tom yam (pre-seasoned) or nam tok-style (thickened with a spoonful of blood)? So to broaden your horizons—and to give you a leg up in ordering—we’ve compiled an illustrated guide to Thailand’s noodle dishes. The list focuses on the country’s noodle soups here—fried noodle dishes would warrant an equally lengthy list—ranging from standards that you’ll find across the country to unique bowls only found in a single village, some never previously described in English. If a Thai town only has one noodle stall, it’s almost certainly selling bamii. A dish with clear Chinese origins that has become a staple across the entire country, at its most basic, bamii unites the eponymous thin, round, or flat wheat-and-egg noodles, a clear, savory, pork-based broth, slices of roasted pork, and parboiled Brassica greens. Variations on the roast pork include peppery shrimp- and/or pork-filled wontons, deep-fried pork belly, roast duck, or in bigger cities—especially those with access to the sea—chunks of crabmeat. The dish is garnished with chopped green onions and/or cilantro, a dusting of white pepper, fried garlic (at old-school places, the garlic is fried in pork fat), and a drizzle of garlic oil. 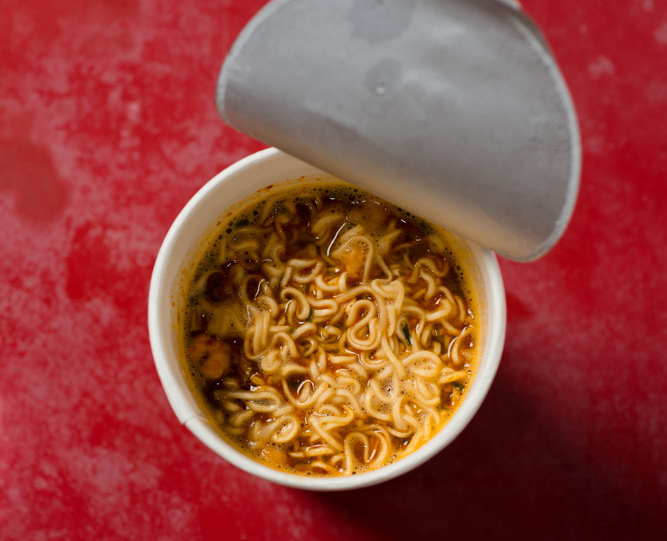 You’ll see bamii served with the standard Thai optional noodle condiments of sliced mild chilies in vinegar, fish sauce, sugar, dried chili flakes, and white pepper, as well as ground roasted peanuts; more traditional places may also serve the dish with Chinese vinegar. It is one of the most common Thai noodle soup dishes to be ordered haeng or with just enough broth to lubricate the noodles. One of Thailand’s most beloved, regionally diverse, and cheapest dishes is khanom jiin: fine, round rice noodles served with various toppings. The noodles, which are thought to be indigenous to Southeast Asia (most noodles in Thailand were introduced by the Chinese), are made via an extremely time-consuming and labor-intensive process. They’re only served fresh and, because they spoil easily, they’re generally consumed the same day they’re made. 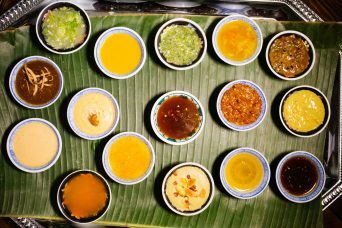 The toppings vary immensely from region to region, ranging from watery, herbal soups to rich, coconut-milk-based curries. A constant is the accompanying tray of all-you-can-eat sides that usually includes fresh vegetables, pickled vegetables, and fresh herbs, and may sometimes include heartier items such as hard-boiled eggs or dried fish. It’s sometimes served with the typical Thai noodle condiments. Unlike most Thai noodle dishes, it is generally not eaten with chopsticks, but rather with a fork and spoon. Although this dish shares a name with khanom jiin and revolves around noodles made essentially the same way, khanom jiin hai lam is thoroughly a Chinese import. 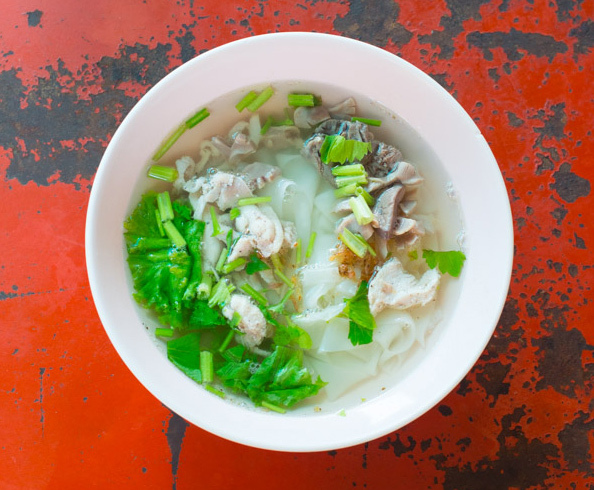 Hailing from the island of Hainan, a bowl combines thick, round, udon-like rice noodles; a clear, beef-based broth; slices of par-boiled beef; thin slivers of beef tripe; and chunks of pickled mustard green. (A pork version, revolving around a pork-bone broth and including slices of par-boiled pork, braised pork stomach, and even deep-fried pork belly, is less common). 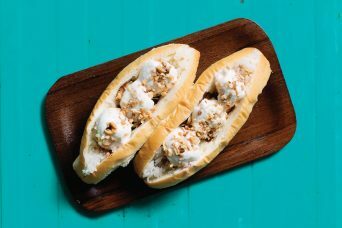 The dish is topped with toasted white sesame seeds and/or dry-roasted peanuts and chopped cilantro. Khanom jiin hai lam is served with a funky, salty condiment that combines fermented Chinese-style shrimp paste and fresh chili. A “dry” version of the dish has the noodles topped with chunks of beef braised in a meaty, almost curry-like broth spiced with five-spice powder, sometimes studded with slices of bamboo. One of the most unique and obscure Thai noodles is khao poep (“folded rice”). To make it, a ladleful of a rice-based batter is poured on a taut cloth suspended over boiling water. When the batter begins to firm up, it’s topped with shredded vegetables and then wrapped over them, resulting in something of a palm-sized wonton. 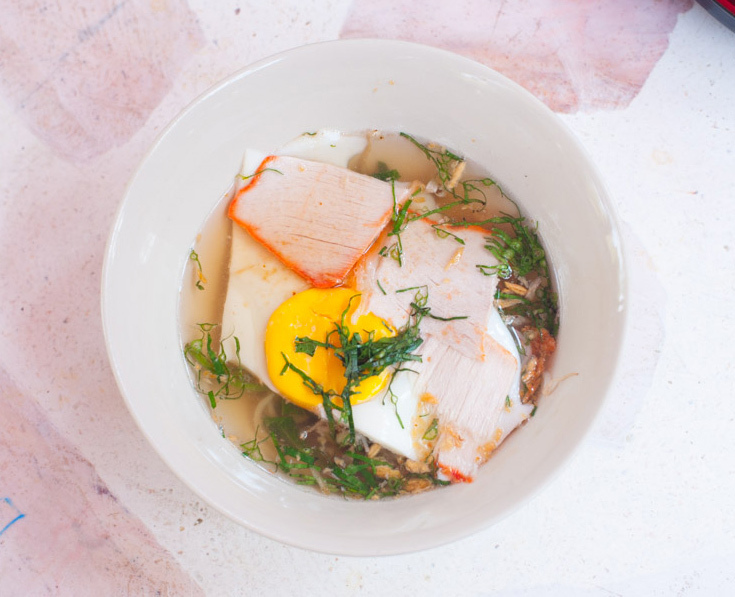 The stuffed noodle is then served in a clear pork-based broth along with a thin slice of roast pork and an egg that’s been steamed in the same manner. The dish is garnished with sliced cilantro and sawtooth coriander, and served with the usual Thai noodle condiments. This northern Thai dish of wheat-and-egg noodles in a rich, fragrant curry broth has garnered a cult following in the U.S. And justifiably so: it’s really, really tasty. With ostensible Burmese origins and palpable Muslim influences, khao soi is usually served with beef or chicken that has been simmered in a coconut milk-based broth based around a curry paste which has a masala powder-like blend of dried spices. A bowl is topped with garnishes of crispy deep-fried noodles, chopped cilantro, and/or green onion, and is served with optional sides of chopped pickled mustard greens, sliced shallots, and a slice of lime. 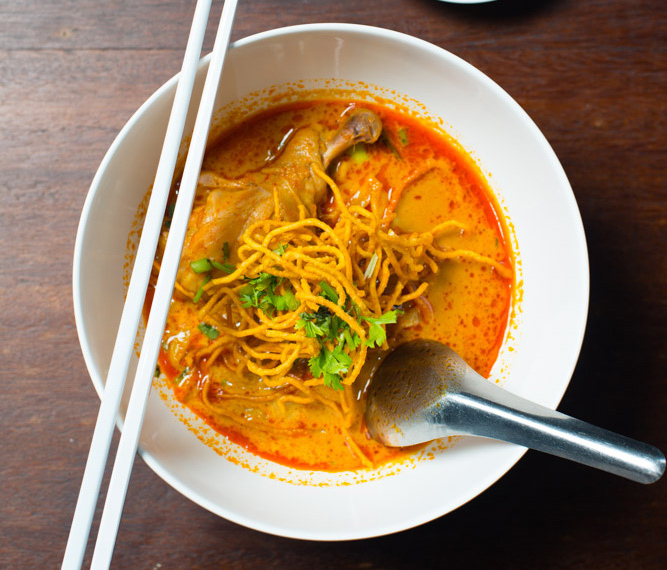 Khao soi is seasoned with the usual Thai noodle condiments, as well as dried chili flakes simmered in oil. 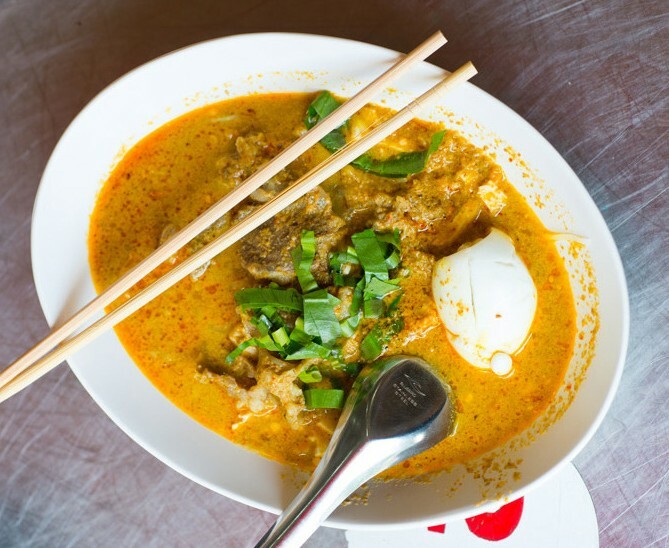 Although they share the same name, khao soi nam naa—linked with the town of Chiang Khong, in northern Thailand—has little to do with khao soi, its curry-based counterpart. 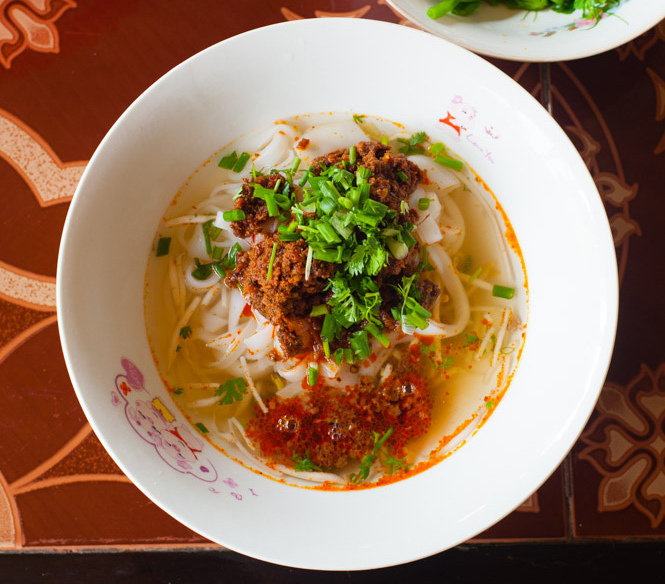 Instead, its medium-width rice noodles are served in a clear, pork-based broth, sometimes with bean sprouts, and topped with spoonful of minced pork simmered in an oily, savory, tomato-based paste. The dish is then garnished with chopped green onion and/or cilantro, and accompanied with optional sides of par-boiled greens and deep-fried pork rinds. The usual noodle condiments are served with it, as well as a salty, savory optional side similar to the pork-and-tomato topping, minus the pork. One of the rarest noodle dishes in Thailand is kiam ii, Teochew Chinese for “round, sharp,” and the colloquial name for the stubby, hand-rolled noodles made from rice flour (which may also include cassava or sticky rice flour). In Thailand, the name has come to refer the dish as a whole, which combines the noodles, a slightly cloudy pork broth, and predominantly porky ingredients that can include loose patties of minced pork; cubes of braised, sweet, fatty pork; pork heart and kidney; and strips of crunchy preserved squid and minced preserved radish. The dish is seasoned with a splash of fish sauce and a dash of white pepper, and is garnished with chopped green onion and garlic oil. The optional condiments served with kiam ii are the same as those served with bamii (sugar, sliced mild chili in vinegar, dried chili flakes, white pepper), although some vendors also serve the dish with a relatively mild condiment of dried chili flakes simmered in oil. Undoubtedly Thailand’s porkiest noodle, and a staple of Bangkok’s Chinatown, kuay jap is a hearty Teochew Chinese dish of noodles served with pork and pork offal in a peppery, pork-based broth. It is most commonly served with wide “carpet roll” rice noodles or, occasionally, kuaytiaw siang hai, translucent or light green noodles made from mung-bean flour. 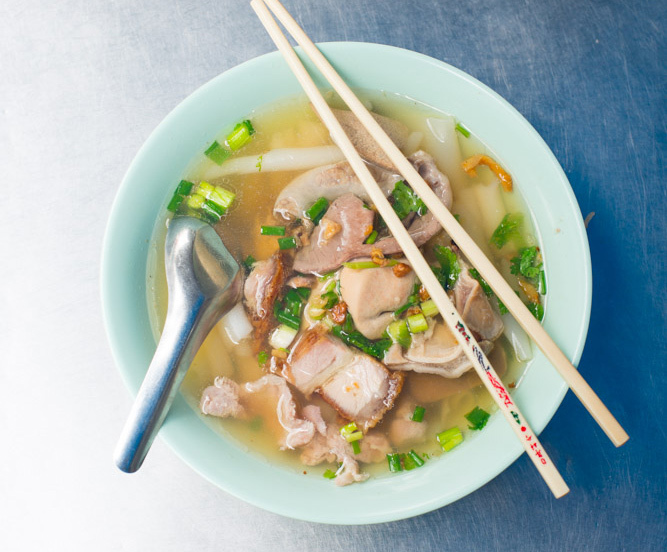 There are two schools of kuay jap: nam sai, meaning “clear,” served with light a broth made from pork backbones, or nam khon, “cloudy,” whose broth is dark with five-spice powder and made just slightly viscous from the addition of tapioca flour. Both versions are served with an array of pork-based ingredients, which can include deep-fried crispy pork belly; braised intestines; stomach, heart, or liver; or cubes of chicken or pork blood; some versions include dried shiitake mushrooms, firm tofu, and/or hard-boiled egg. Kuay jap is garnished with chopped green onions and/or cilantro, white pepper, and, on occasion, bits of deep-fried dough. It’s served with the usual Thai noodle condiments. Predominantly associated with northeastern Thailand, especially the provinces that border the Mekong River, this unique noodle dish has ostensible Vietnamese origins. 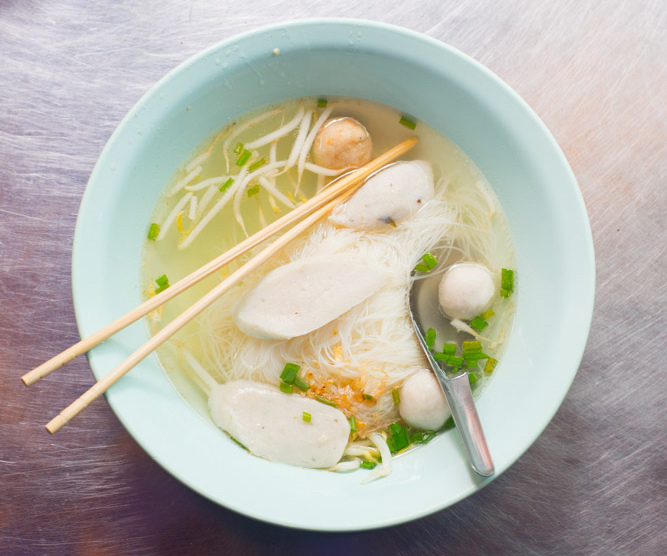 Although kuay jap yuan itself doesn’t have an exact counterpart in Vietnam, the long, thin, round noodles made from rice flour, cassava (tapioca) flour, and sometimes sticky-rice flour are similar to Vietnamese bánh canh. Unlike most Thai noodle dishes, the noodles are cooked directly in the broth (in this case, a peppery pork-bone broth), their cassava flour dusting giving it a cloudy, slightly viscous texture. The noodles and broth are supplemented with slices of peppery Vietnamese pork sausage, braised pork meat and/or ribs, and sometimes quail egg and shiitake mushrooms; the dish is garnished with deep-fried crispy shallots and chopped green onion. Kuay jap yuan is served with usual noodle condiments, as well as a condiment of dried chili flakes simmered in oil. Literally “curry noodles,” this dish takes the form of thin rice noodles served in a fragrant, often sweet, coconut milk-based curry broth. As the dish is served almost exclusively by Thai Muslims, it may include either beef or chicken, but never pork. Other common ingredients include diced tofu, a hard-boiled egg, and bean sprouts. A bowl is garnished with chopped cilantro, deep-fried shallots, ground roasted peanuts, and diced preserved radish, and is served with the usual noodle condiments, occasionally supplemented with a slice of lime. 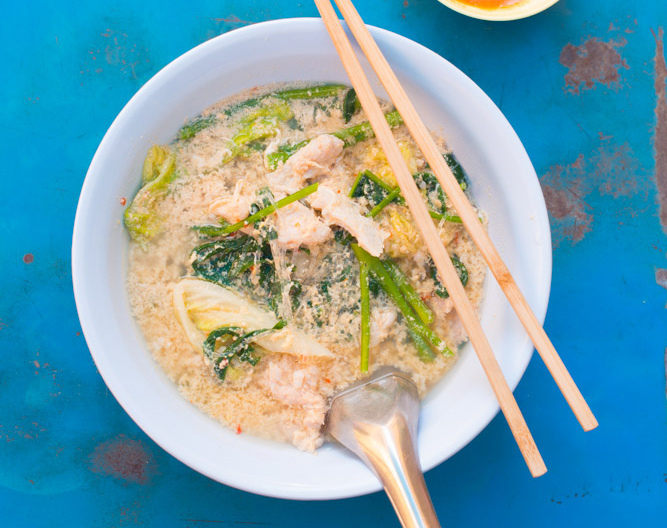 At its most basic, kuaytiaw kai combines rice (or less commonly, wheat-and-egg) noodles in a clear, typically savory, chicken-based broth, with shredded poached or braised chicken or, occasionally, gizzards or wings. The dish can also include bean sprouts, Chinese celery, or lettuce, and is typically garnished with fried garlic, cilantro, and/or green onion, and served with the usual Thai noodle condiments. A relatively unknown but delicious Thai noodle dish is “Hakka noodles,” named after the ethnic group from southern China. The most noteworthy aspect of the dish is its meaty element, which can include firm tofu stuffed with minced pork, smooth fish balls, coarse pork balls, deep-fried balls of pork and shrimp, slices of fish cake, or wonton- and “rugby”-shaped balls made from fish. 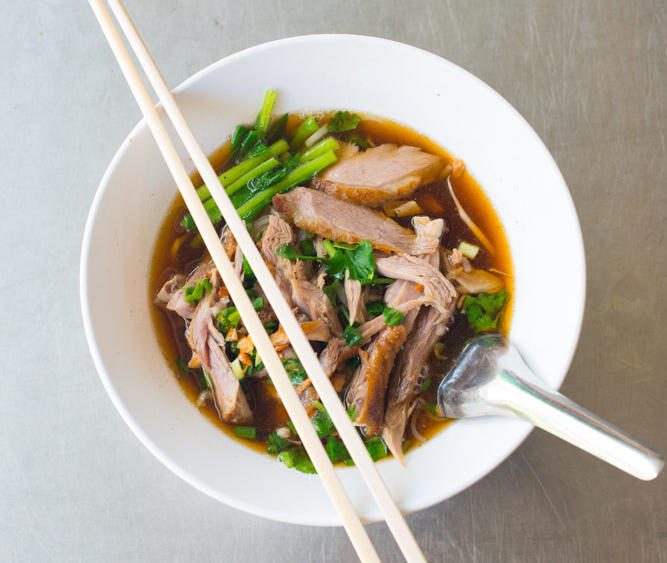 These are served in a light and clear (yet savory and sometimes peppery) broth, typically made from both pork and fish, and are generally supplemented with bean sprouts and shredded lettuce. The noodles—typically rice, but wheat-and-egg are also an option—are topped with garlic oil and green onion, and the dish is served with the usual noodle condiments in addition to ground fresh red chilies and garlic in vinegar. Lawt means “tube,” a reference to cheong fun, Chinese rice noodle rolls. Yet in this dish, the dim sum staple is essentially deconstructed, where the noodles—often flecked crimson from tiny dried shrimp—are steamed loose in bamboo baskets before being scattered in a shallow bowl and topped with ingredients like cubes of pork, dried shiitake mushrooms, and firm white tofu braised with five-spice powder; slices of Chinese sausage; minced preserved radish; and steamed bean sprouts. The mixture is seasoned with a dollop of sweet soy sauce (or more—kuaytiaw lawt can often be quite sweet), lubricated with a scant ladleful of the braising liquid, and garnished with fried garlic and chopped Chinese celery. Kuaytiaw lawt can be served with the usual noodle condiments, in addition to a condiment that blends soy sauce, sesame oil, sugar, and fresh chili. Unlike many of its counterparts, it is eaten with a fork and spoon. 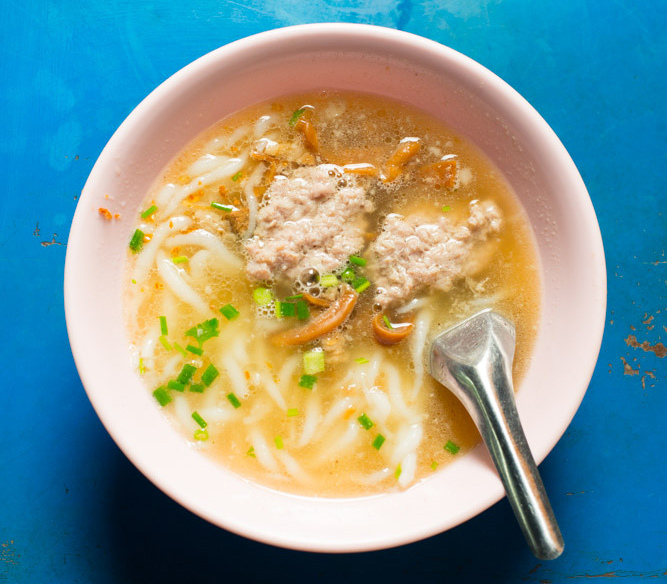 The ham sandwich of Thai noodle dishes is kuaytiaw look chin: rice (or, slightly less commonly, wheat) noodles served in a clear, savory broth with meat-based balls. 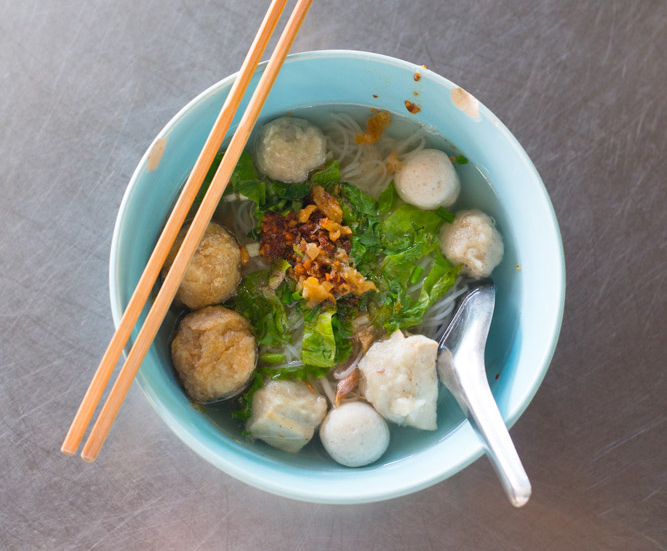 The most ubiquitous version is probably kuaytiaw look chin muu (ก๋วยเตี๋ยวลูกชิ้นหมู), which combines a clear pork broth and pork balls, often supplemented with ground pork and/or thin slices of par-boiled pork. Not far behind in terms of popularity is kuaytiaw look chin plaa (ก๋วยเตี๋ยวลูกชิ้นปลา), the fish variant, which can also include slices of fish cake, par-boiled fish or fish-based noodles, and shredded lettuce. Both bowls are garnished with green onion, white pepper, and garlic oil, and are served with the usual noodle condiments. Thai-style beef noodle soup is based around a beef bone-based broth that can be clear and savory (nam sai); relatively dark, slightly sweet, and fragrant with dried spices (nam khon); or dark and hearty with the addition of beef blood (nam tok). The dish is served almost exclusively with standard Thai rice noodles or, alternatively, kao lao—meaning that it’s served with no noodles but rather a bowl of rice. The noodles are supplemented with thin slices of par-boiled beef, tender chunks of braised beef, braised offal (tripe, intestines, liver, heart), and peppery beef balls. A bowl is garnished with fried garlic and garlic oil, white pepper, and coarsely chopped Chinese celery, and served with the usual Thai noodle condiments. Specific to beef noodles is a condiment of fresh, spicy chilies, dry-roasted until nearly charred and then coarsely ground with clear or sometimes fruit vinegar. It has a dark color and a spicy, tart flavor, and is used as a dip for the pieces of beef rather than added directly to the broth. 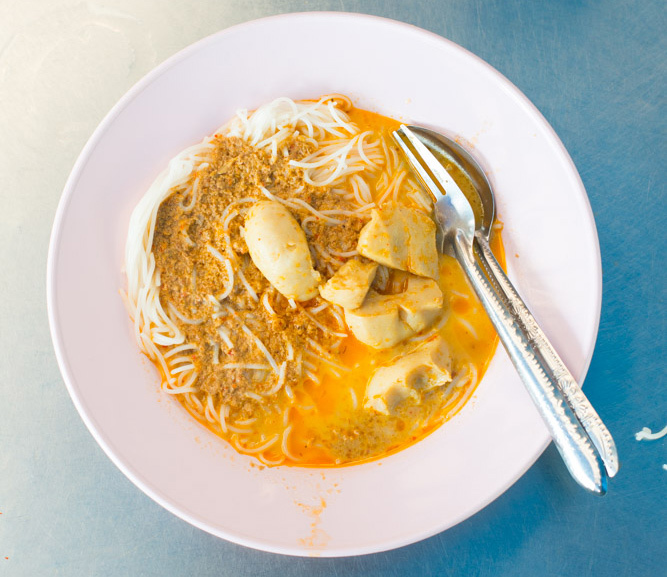 Arguably Thailand’s most full-flavored noodle dish, kuaytiaw ruea translates as “boat noodles,”—the dish used to be served directly from small boats that plied the canals of Bangkok and central Thailand. 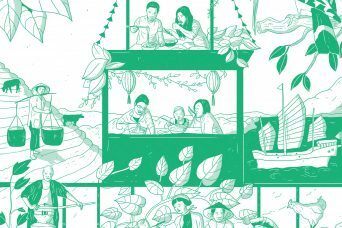 Today, most of the restaurants serving boat noodles are land-bound, but many vendors continue to prepare the noodles in a serving area made from a decommissioned pirogue. Boat noodles generally take the form of petite bowls that combine a small amount of broth (pork or beef), noodles (typically rice noodles, but sometimes wheat-and-egg noodles), slices of par-boiled meat, braised meat and offal (liver, tripe, heart), meatballs, and par-boiled phak bung (a crunchy, semi-aquatic vegetable known colloquially in English as morning glory or water spinach). The broths are different for the beef (darker, richer, more fragrant) and pork (lighter, sweeter) versions of the dish, although most eaters opt for nam khon, meaning that the broth is dark in color due to the addition of herbs (allegedly vendors would also include marijuana) and dried spices, or nam tok, meaning that the broth has been thickened with blood. To order, a bowl is generally preseasoned with MSG, sugar, dried chili powder, fish sauce, and a chili/vinegar condiment, and then garnished with garlic fried in pork or beef fat and sometimes chopped green onions and/or cilantro. Boat noodles are served with the usual noodle condiments as well as phrik nam som— small, fresh chilies dry-roasted until charred, coarsely ground and preserved in white vinegar. The dish is also served with optional condiments of Thai basil and bean sprouts, and is often eaten with a tiny bag of deep-fried pork rinds. 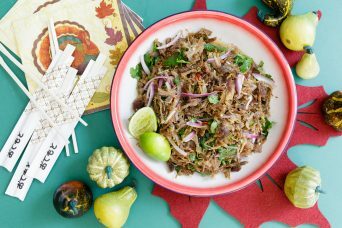 This dish, with origins the eponymous town in northern Thailand, is essentially a mash-up of a Chinese noodle dish and Thai-style seasonings. It combines a clear, pork bone-based broth, rice (or occasionally wheat) noodles, slices of roast pork (and sometimes par-boiled pork and offal), ground pork, and sliced green beans. Similarly to tom yam-style noodles, a bowl is preseasoned with sugar (in this case, palm sugar), dried chilies, and ground peanuts. Sukhothai-style noodles are often garnished with chiffonaded sawtooth coriander, and are occasionally served with a slice of lime. 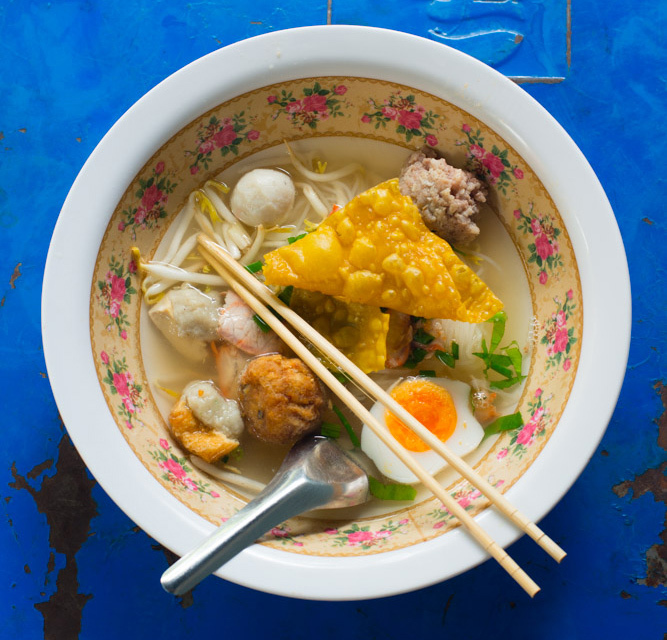 A variation on the dish is kuaytiaw chaa kang rao (ก๋วยเตี๋ยวชากังราว), a bowl associated with the town of Kamphaeng Phet, also in northern Thailand. It combines a clear, pork bone-based broth; thin, firm wheat-and-egg noodle; and slices of roast pork, par-boiled pork, and offal. Like kuaytiaw sukhothai, a bowl is preseasoned with sugar, dried chilies, and ground peanuts. It’s garnished with chiffonaded sawtooth coriander and served with optional sides of sliced lime and par-boiled green beans and bean sprouts. Less a dish and more a method of seasoning is tom yam, which takes its name from Thailand’s famous spicy/sour soup. When making kuaytiaw tom yam, a bowl of noodle soup (and just about any noodle soup can receive this treatment) is preseasoned with a squeeze of lime, a splash of fish sauce, a spoonful of sugar, and a pinch of dried chili. Tom yam-style noodles are often served with a garnish of ground peanuts and/or thinly sliced sawtooth coriander, a deep-fried wonton cracker, and sometimes a hard-boiled egg. Tun is a cooking term with Chinese origins that refers to simmering or steaming. When noodles are involved, tun generally means duck, goose, chicken, or (less commonly) beef or pork, simmered until tender in a broth seasoned with Chinese ground spices (a variant particularly popular among Bangkok taxi drivers combines chicken and bitter gourd). The meat and braising liquid are coupled with the standard Thai wheat or rice noodles or served kao lao, with a bowl of rice in place of noodles. Other ingredients include offal (or in the case of duck, cubes of duck blood), bean sprouts, and greens (either Chinese kale or phak bung). The dish is garnished with fried garlic and chopped green onions or cilantro. Kuaytiaw tun is served with the usual noodle condiments, as well a tart, slightly spicy, orange-colored condiment of ground fresh chilies and garlic in white vinegar. 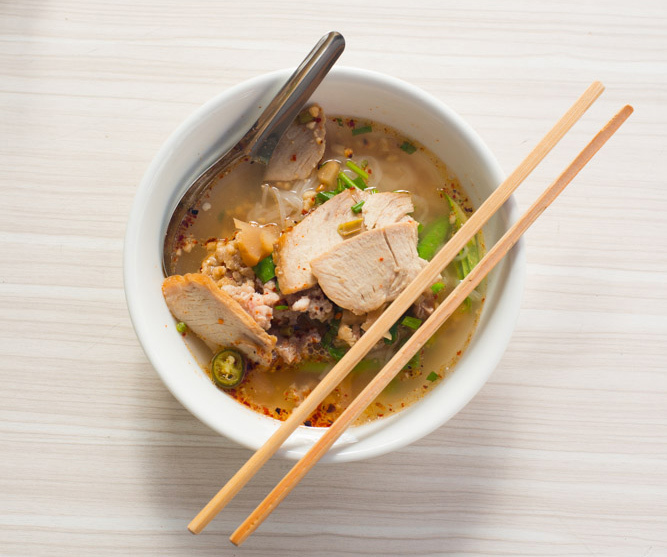 Any list of Thai noodle dishes would be incomplete without a mention of Mama. A brand name, Mama has come to mean instant noodles. 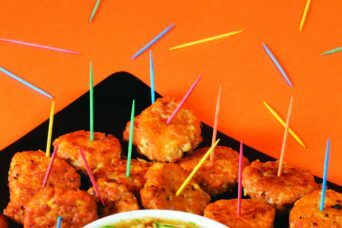 And although they’re mostly consumed at home—typically augmented with an egg and eaten in front of the TV—a handful of restaurants and stalls in Thailand specialize in preparing the noodles for diners, supplementing them and the MSG-laden spice packet with a fresh broth, minced pork or seafood, par-boiled greens, and an optional spicy condiment. A Thai take on Japanese sukiyaki, sukii is also the only Thai noodle soup dish that invariably revolves around wun sen—thin, clear noodles usually made from mung-bean starch. The noodles are served with seafood, pork, or beef—or a mix of all of these proteins—and supplemented with napa cabbage, green onion, and phak bung. A raw egg is beaten into the broth, giving the dish a cloudy appearance. Sukii is served with a mild, savory dipping sauce that combines several ingredients, including fermented tofu, vinegar, bottled chili sauce, sesame oil, and garlic. 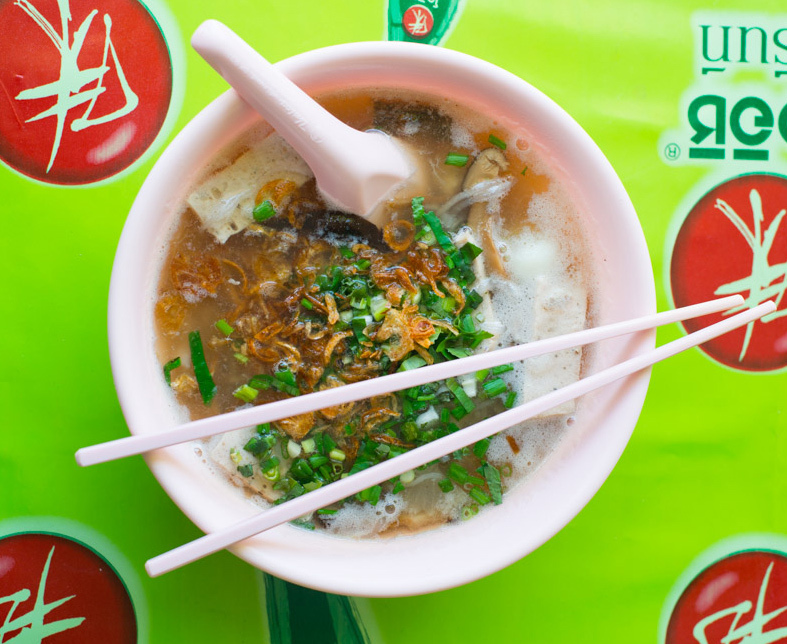 One of the more intimidating—and popular—noodle dishes, especially in Bangkok and central Thailand, is yen ta fo. 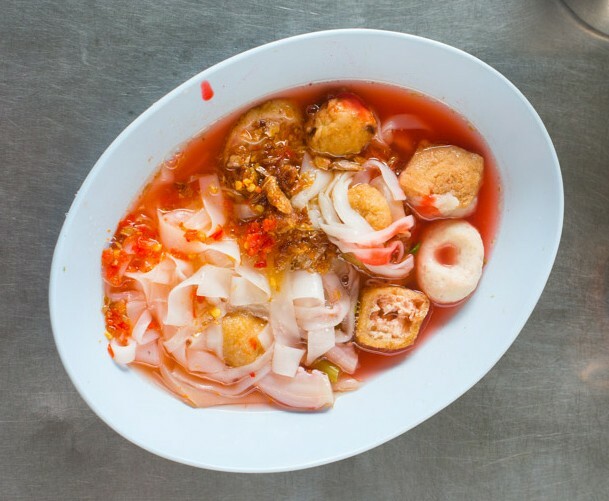 The name is probably derived from yong tao foo, Hakka Chinese for “stuffed tofu,” but yen ta fo’s most noteworthy attribute is undoubtedly its bright-pink broth, whose color stems from seasonings that include red fermented tofu and, nowadays, ketchup. The dish combines rice or wheat noodles, the aforementioned crimson and typically sweet pork-based broth, and seemingly disparate ingredients that can include fish balls, par-boiled seafood, slices of fish cake, preserved squid, deep-fried tofu, stuffed tofu, deep-fried balls of pork and shrimp, cubes of chicken or pork blood, a deep-fried wonton cracker, and phak bung. Yen ta fo is garnished with fried garlic, and is served with the usual Thai noodle condiments as well as ground fresh red chilies and garlic in vinegar. This might be one of Thailand’s most obscure noodle soups, really only available in provinces in the north of the country that border Myanmar. 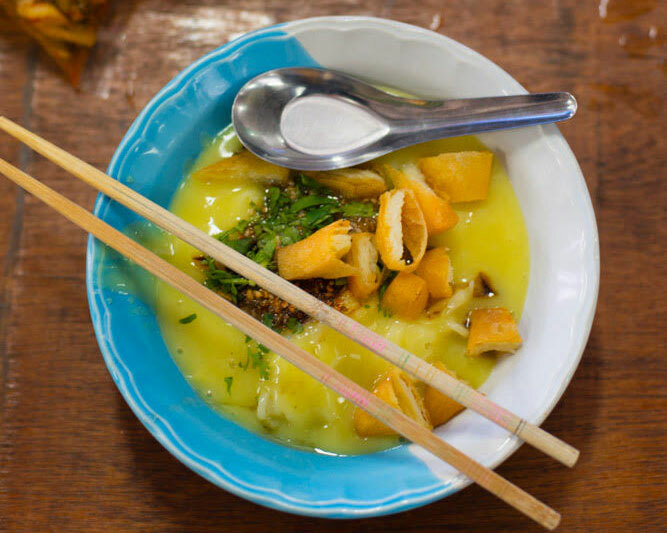 It takes the form of flat rice noodles in a savory, yellow and admittedly rather gloopy broth made from split peas and turmeric—a mixture that in Myanmar is colloquially referred to as “Burmese tofu.” The dish is garnished with chopped cilantro, chili oil, crispy garlic, soy sauce, and crunchy bits of the deep-fried Burmese tofu. —Hakka: An ethnic group from southern China.—Kao lao: A bowl of noodles without the noodles, accompanied instead by a bowl of rice.—Kuaytiaw: The Thai word for noodle soup; the term is thought to be derived from guo tiao, which in various southern Chinese dialects means approximately “threads of cooked rice.”—Sen: Literally “threads,” sen is a generic word for noodles, but in practice it often refers to sen kuaytiaw, the rice-based noodles common in Thailand. Sen mii are thin and round, similar to vermicelli; sen lek, “small threads,” flat and slightly wider, are probably the most common Thai noodle; and sen yai, “big threads,” are wider still.—Teochew: An ethnic group from southern China with a strong historical influence on Thai food. Get recipes, restaurant recommendations, essays, and art delivered to your inbox every week.